Austrians have helped Syrian refugees: Austria’s far-right parties may still benefit politically. Austrians have generously stepped up to help Syria’s refugees. But it is the country’s far right that may benefit most. 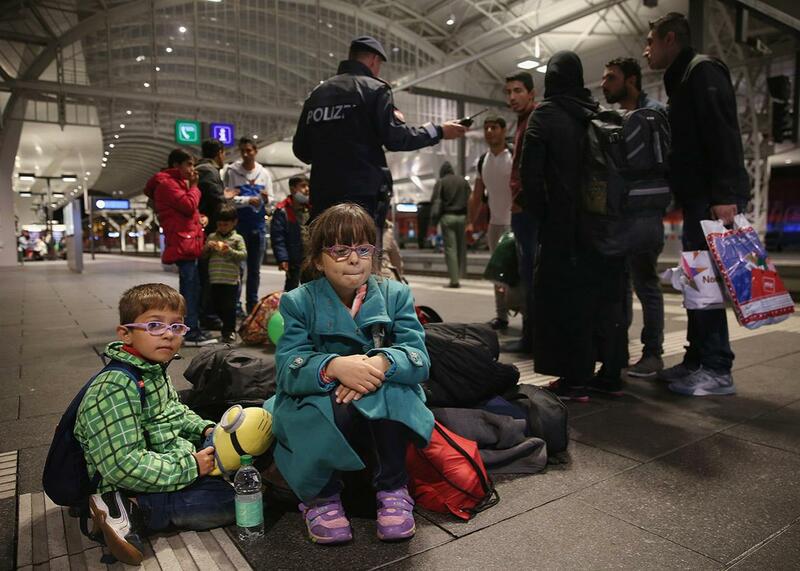 Syrian refugees wait on a railway platform at Salzburg Hauptbahnhof train station in the hope of catching a train to Germany on Sept. 14, 2015, in Salzburg, Austria. In the spring, when Syrian refugees began walking across the Hungarian border into Austria, they came in a steady stream of about 150 a day. The Austrian government responded by erecting Red Cross tents in the middle of fields at a time when the country was experiencing the coldest and rainiest season on record. The damp penetrated the narrow cots; the grass flooded so quickly, the Red Cross had to lay planks on the ground to walk. At a tent city in Linz, two toilets were available for 140 men. In the face of such wretched conditions, everyday Austrians brought the refugees new shoes and raincoats. In the summer, when the refugees were still in those tents because state and local officials refused to find them permanent homes, Austrians offered up their summer cabins and apartments. One ski resort opened its dorms used over the winter for instructors. By late summer, more than 3,000 people were housed in a complex built for 1,800. An Amnesty International report called Austria’s intake center in Traiskirchen “degrading” and “inhumane.” Again, Austrians stepped up to make the best of a terrible situation, providing clothes, food, toiletries, and toys. In the past few months, Austria’s quiet, conservative citizens have made a name for themselves as more open and liberal-minded than anyone would have guessed. At every step of the way, young and middle-age Austrians have offered to help refugees when their government would not. But that social action isn’t likely to turn into an emboldened political movement on the left. Although Austria is one of Europe’s wealthiest countries and has the sixth-lowest unemployment rate in the European Union, its ruling coalition is reluctant to care for its burgeoning refugee community. Although one opposition leader described the centrist coalition government’s response as a “management failure,” most Austrians thought it was more insidious than that: It was deliberate. Austria, they felt, was sending a clear message to people dodging Syrian President Bashar al-Assad’s chemical weapons attacks and marauding ISIS jihadists: Don’t come. This is an election year in Austria, where state elections will begin at the end of the month. So opposition parties charge that Interior Minister Johanna Mikl-Leitner, from the center-right People’s Party, is doing as little as possible without sounding callous. She in turn pushed the blame for the subpar conditions on the states and cities. Intentional or not, the government’s plan seems to have worked. Word spreads fast among refugees, so when Germany announced it would take up to 800,000 Syrians, that stream of refugees became a flood—and only a handful wanted to remain in Austria. Under EU rules, up until German Chancellor Angela Merkel’s announcement, refugees found in Austria had to stay there. A vast number, however, were paying smugglers to cross into Germany. Then, in late August, after 71 refugees were found suffocated in a refrigerated truck, they abandoned the EU rules and refugees stormed through Austria into Germany like a tsunami. Again, Austrian volunteers stepped up daily to help at train stations and along the Hungarian border. The 150 refugees pouring into Austria each day became 1,000 a day. Over the weekend, more than 11,000 entered in a 24-hour period. Volunteers set up Facebook pages explaining how many volunteers they required and using Doodle schedules to ensure help was available around the clock. They posted urgent messages stating what specific items the refugees needed most: jackets, men’s size medium and small! More bottled water! Dates and nuts, please! Nearly every volunteer I encountered said they were helping because there was no political leadership in their country. These Austrians are fed up with the lack of leadership and say they are done with political parties. None had even thought about the upcoming elections, and most said they weren’t likely to vote: “Who would I vote for?” is the most common response. Maria called the Austrian volunteers “asocial” and “young and stupid.” But she was only echoing the message from the far-right Freedom Party, the country’s largest opposition party, which has consistently fought against the influx of refugees. They are spreading fear that Austria will lose its European and Christian culture if the predominantly Muslim asylum seekers are allowed to stay. They ignore the fact that the more than 30,000 people expected to request asylum would represent less than 0.4 percent of Austria’s 8.5 million population. The Freedom Party also states that “most” refugees are actually economic migrants, not people fleeing war. This is a lie often repeated by Hungary’s illiberal Prime Minister Viktor Orban, a good friend of Freedom Party leader Heinz-Christian Strache. Strache, too, questions their motives and in Facebook posts always refers to them as “refugees” in a mocking way. Strache has called on Austria to follow Orban’s lead and build a fence around its borders, a fairly daunting task since Austria borders eight countries. 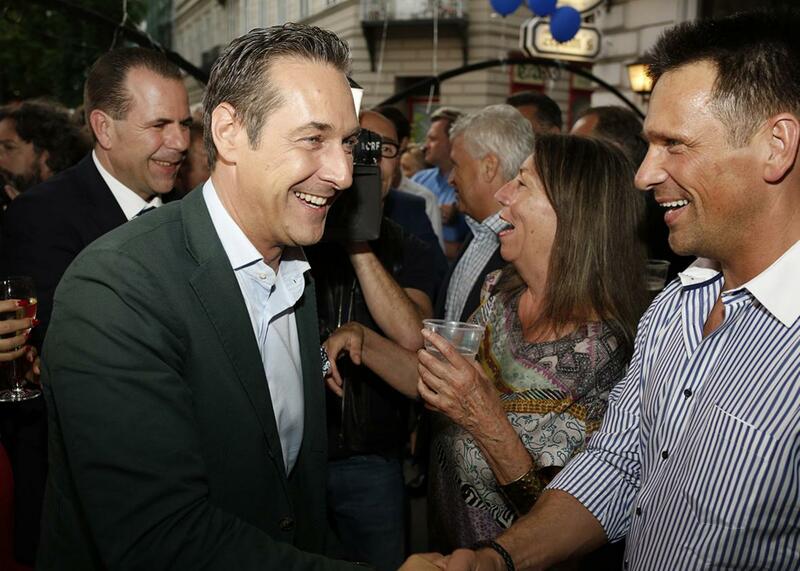 Heinz-Christian Strache (left), leader of the right-wing Austrian Freedom Party, celebrates with supporters after European Parliament elections on May 25, 2014, in Vienna. Perhaps most effective is the fear that the Freedom Party instills in the elderly. If the refugees keep coming, tax revenue will be taken away from the health system; medications will cost more; housing—already a problem in Vienna—will be used for Austria’s newest residents, Strache warns. According to the latest Gallup poll, more and more voters are slowly accepting the Freedom Party’s message as truth. The first state election will be Sept. 27 in Upper Austria, where the Freedom Party appears to have gained nearly 11 points since the last poll in early spring. In Vienna, the election is Oct. 11. Pundits now say they wouldn’t be surprised if the Freedom Party garners perhaps 32 percent or more, making it the strongest party in the capital. If traditional supporters of the centrist parties are truly disgusted by their country’s response to the refugee crisis, they may be less likely to turn up at the upcoming elections, further opening the far right’s opportunity to make gains. Strache is a charismatic figure, with piercing blue eyes and a boyish look. The trained dental technician has worked tirelessly with France’s Marine Le Pen, Netherlands’ Geert Wilders, and Hungary’s Orban to build a socially acceptable far-right party in the EU with strong anti-immigration policies as a main position. Like his European counterparts, Strache is a euro-skeptic and runs his election campaigns like a cult of personality. It is impossible to go anywhere in Austria without seeing his smiling face. When he announced his intention to run for mayor of Vienna in June, he vowed to keep the capital free of Turkish road signs, in a reference to the high number of working migrants. Now he gets to go one step further and promise not to force women to wear headscarves. The fearmongering continues.